Looking for a beautiful way to express your personal style? 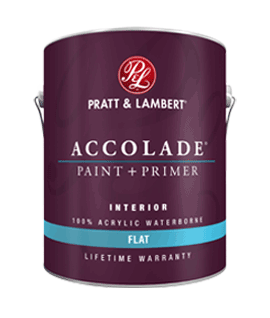 Pratt & Lambert Accolade interior paint + primer, our finest interior paint, is formulated to go on smoothly and provide a rich, luxurious coating for a beautiful, stunning finish. The 100% acrylic formula is durable and easy to maintain. Trusted performance, proven results. Used on properly prepared: Walls, ceilings, trim, drywall, plaster, wood, masonry, metal and previously painted surfaces. Click HERE for complete data on preparation, application, cleanup and tips. Don’t get stuck with too little or too much paint. Use this tool to find out how much will be right for the job. Click HERE for a gallon calculator. Every finish has different attributes that make it ideal for different rooms. Understanding them is key to making walls look their best. Click HERE for finish information.